Film-Arcade.net: Official Teaser Trailer and Poster for Heist Comedy "Masterminds"
Official Teaser Trailer and Poster for Heist Comedy "Masterminds"
Relativity Studios recently released the official teaser trailer and poster for Jared Hess' (Napoleon Dynamite; Nacho Libre) new film "Masterminds". The film stars Zach Galifianakis, Owen Wilson, Kristen Wiig and Jason Sudeikis. "Masterminds" hits theaters on August 7th. 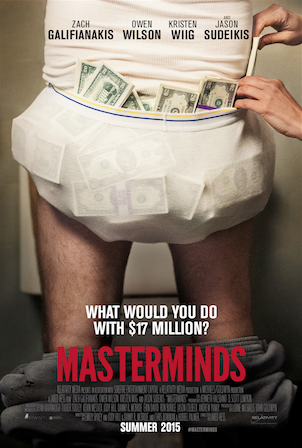 Masterminds will be released domestically on August 7th, 2015 by Relativity Studios.